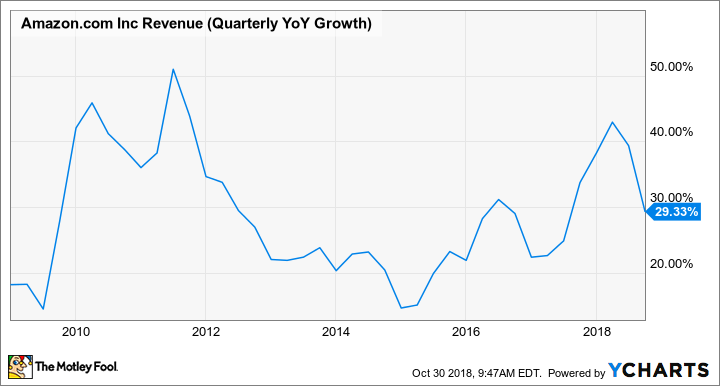 Amazon's revenue growth appears to be decelerating dramatically in the second half of 2018. It's not the first time this has happened to the e-commerce pioneer. 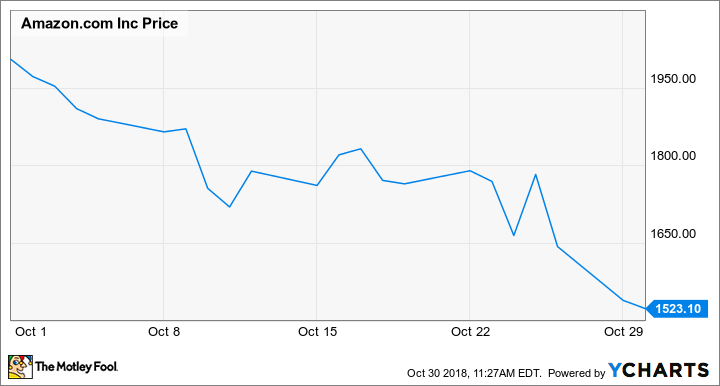 Amazon.com (NASDAQ:AMZN) stock has been eviscerated in October, losing about a quarter of its value since the beginning of the month. A broader market rout helped spark the initial setback for Amazon shares. However, the stock's retreat accelerated after the e-commerce giant reported that revenue growth slowed in the third quarter of 2018 and may slow further next quarter. Amazon.com October Stock Performance, data by YCharts. Let's take a look at Amazon's third-quarter earnings report and whether investors should be worried about the recent change in its revenue trajectory. It's hard to imagine investors being upset about an earnings report when earnings per share come in more than 80% ahead of analysts' expectations, but that's exactly what happened to Amazon.com last week. Amazon reported EPS of $5.75 for the third quarter, far ahead of the average analyst estimate of $3.14. This also represented an 11-fold increase over the company's Q3 2017 EPS of $0.52. Yet sales came in at $56.6 billion, about $500 million below the average analyst estimate. While this was in the upper half of the guidance range that Amazon had provided three months earlier, and 29% higher than its revenue in the prior-year period, investors still weren't satisfied. Excluding revenue from "physical stores" -- mainly the Whole Foods chain acquired last year -- Amazon's revenue grew 23% last quarter, compared to 29% in the first half of the year. While investors were dismayed that Amazon's revenue growth is decelerating, this isn't the first time the e-commerce giant has run into revenue headwinds. The same thing happened earlier this decade. In 2011, Amazon's revenue surged by nearly $14 billion, reaching $48.1 billion. For the next three years, Amazon delivered similar levels of absolute revenue growth, ranging between a low of $13.0 billion in 2012 and a high of $14.5 billion in 2014. But this meant the company's percentage growth rate slowed steadily as Amazon grew larger. In total, Amazon's revenue growth rate plummeted from a little more than 40% in 2011 to just shy of 20% in 2014. Amazon's growth rate was even lower in certain quarters near the end of that period. This trend was a big reason why I was skeptical of Amazon stock even when it was trading for less than $400. Amazon.com Revenue (Quarterly YoY Growth), data by YCharts. YOY = year over year. Yet Amazon managed to beat the odds -- and my expectations -- and reaccelerate its growth rate. Whereas it once seemed to be struggling to add more than $15 billion to its top line in a year, Amazon is on track to grow revenue by about $55 billion in 2018 -- or $43 billion excluding the Whole Foods acquisition. It's inevitable that Amazon's growth rate will slow eventually. A 24% compound annual growth rate (CAGR) would give Amazon more than $3 trillion of revenue by 2030. Even a 20% CAGR would push revenue past $2 trillion by then. And since Amazon only books the commission portion of third-party sales, its total merchandise volume would be trillions of dollars higher than these figures. As impressive as Amazon is, this level of growth seems implausible. On the other hand, Amazon is still growing at an amazing rate, considering its size. At the same time, its profit margin is improving rapidly as the lucrative Amazon Web Services segment continues its growth, and as the North American retail business starts to capitalize on the massive investments it has made over the past several years. Amazon's recent margin gains suggest that it can deliver rapid earnings growth going forward, even if revenue growth may fall below 20% for good within a few years. I'm still not inclined to run out and buy Amazon stock right now. But with the stock price now sitting near $1,500 rather than $2,000, and the company's profit margin rising quickly, Amazon shares look more appealing than they have in years.